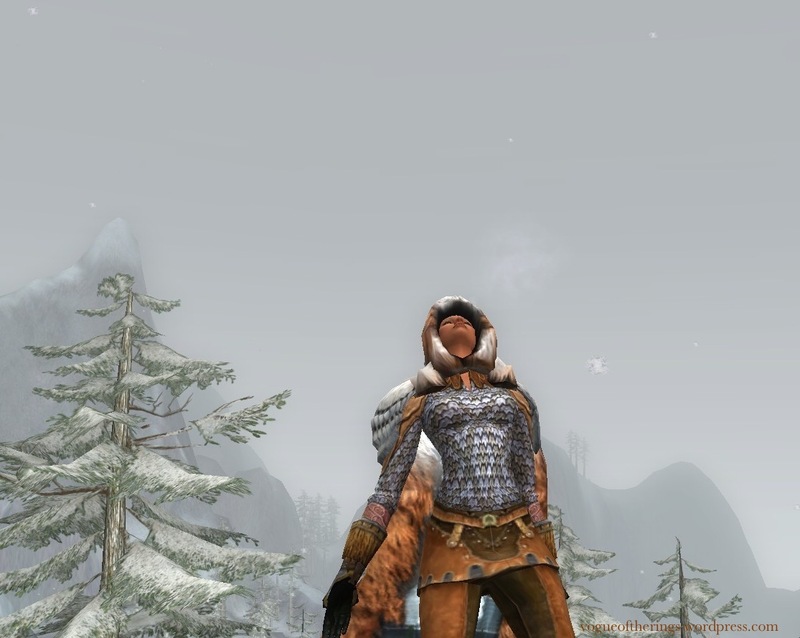 The Cloak of Winter Nights is one of my favorites in the game, and I couldn’t wait to create an outfit around it. 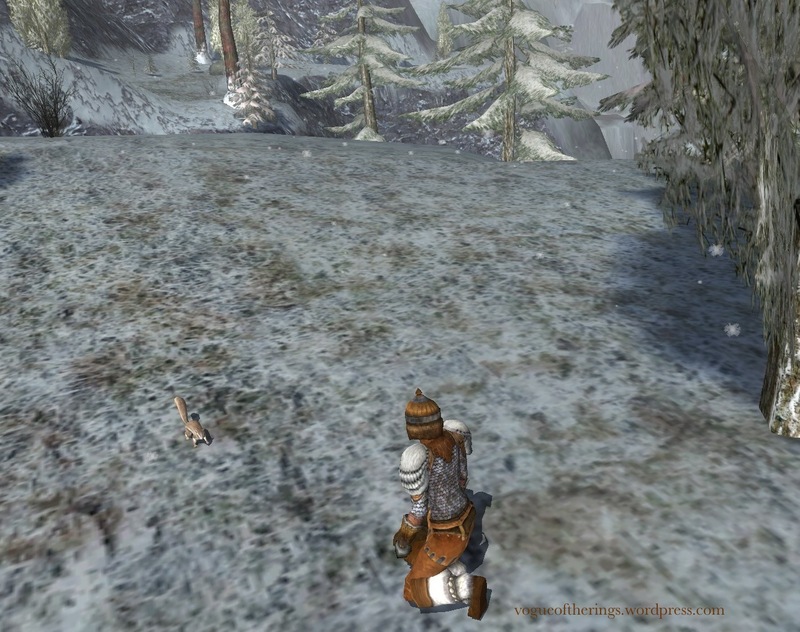 Especially after reading this post by Hymne from Lotro Cosmetics; I wanted to show other ways to use this fantastic piece. This has ended up being one of my very favorite outfits, allowing her to remain a formidable warrior while softening out her edges. Taking a break to catch snowflakes on my tongue. The Misty Mountains are such a gorgeous, soft-focus zone, for the first time I felt the desire to be in harmony with my surroundings instead of contrasting with them. Maybe it’s because I grew up snuggled against the Rocky Mountains, but this zone feels so wonderfully cozy to me. When the clouds lower into the valleys you can practically hear the still-quiet hush of snow falling. 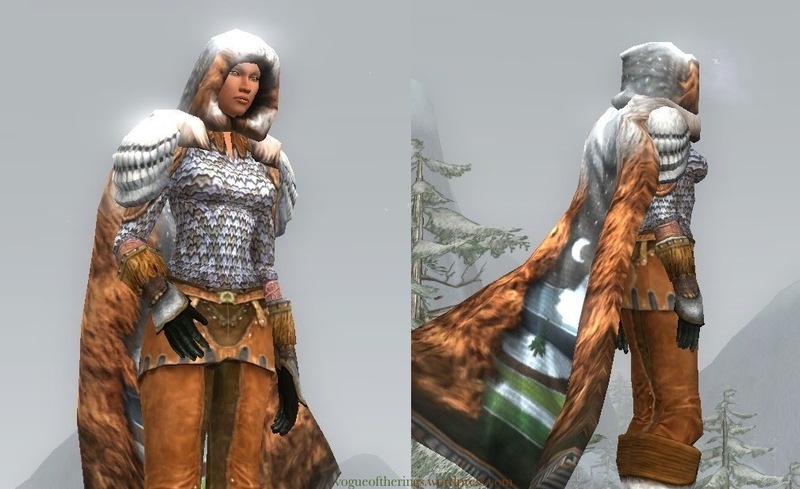 When combat dictates that a cloak is no longer practical, she removes it and reveals the Southern Helmet Saeradan gave her so long ago on the green fields of Bree-land. The fur ear-and-neck covering of the helmet goes so perfectly with the Snow-dusted Travelling gloves, it’s like they were made for each other. Sure we are! Haven’t you ever heard of the Darling Thuds of Grea…t Axes?